Productivitypro is an adware application from SuperWeb group. You most probably do not even notice how this application enters your computer. Productivitypro is not a dangerous computer infection, but it would be in your best interest to remove Productivitypro from the system immediately. If you fail to do that, you will be plagued with a number of annoying commercial advertisements every time you access popular online shopping websites. Adware programs cannot be allowed to remain on your system because they might be related to various cybercrime schemes. As Productivitypro is just another application from SuperWeb family, we can tell that it is identical to FourFinders, Caramava Ads, Hatchiho and other similar applications. This program is responsible for displaying Productivitypro Ads or Productivitypro pop-ups. You may not realize that you have adware application on your computer, but if you were to check the list of plug-ins in your browser’s settings, you would find Productivitypro there. It should be pointed out that this application is compatible with Mozilla Firefox and Internet Explorer browsers only. The official website at myproductivitypro.com claims that this application should work on Google Chrome as well, but the newer versions of Google Chrome browser obviously block the app. It should be enough of a proof that Productivitypro is a potentially unwanted application that should be deleted from your PC at once. You might say that you do not remember installing Productivitypro onto your PC, and you have no idea where Productivitypro ads are coming from. It is true that there is no direct link available at the official homepage, but all SuperWeb adware applications travel bundled with freeware. It means that if you download a freeware application from a third-party website, and it comes bundled with adware, chances are that you will soon see Productivitypro pop-ups on your browser. The official website claims that Productivitypro is a new tool that can improve your web search. However, our security researchers say that this application might be used to collect data on your shopping and browsing habits for marketing purposes. It is not illegal, but you should be careful because you can never know who will make use of this information. What is more, Productivitypro does not review the content embedded into its ads, so you click them at your risk. Do not be surprised when Productivitypro pop-ups redirect you to unfamiliar and perhaps even dangerous websites – cyber criminals often exploit adware programs for their malicious purposes. 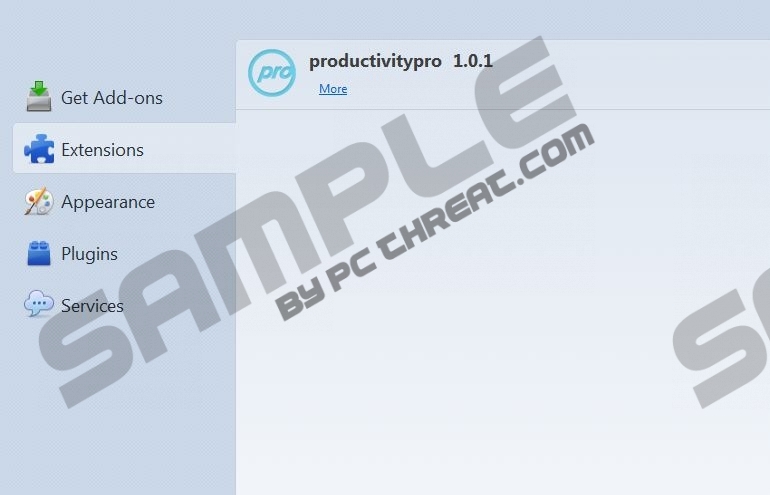 To remove Productivitypro from your PC, simply uninstall it via Control Panel. The extensions from your browser should disappear automatically. Eventually, run a full PC scan with SpyHunter free scanner, as it will help you ensure that your system is free of any potential threats. Also, should you have any further questions, do not hesitate to contact us by leaving a comment in the box below the description. Select Uninstall a program and remove Productivitypro. Click Uninstall a program and remove Productivitypro. Open Add or remove programs and uninstall Productivitypro. Quick & tested solution for Productivitypro removal.